Years ago, Peter Drucker said “Nothing good happens by accident—put some structure around it!” So if you want something good to happen, put some structure around it. This doesn’t just apply to business; it’s also for family life. I can name several traditions that are perfect examples of Drucker’s line of thinking. 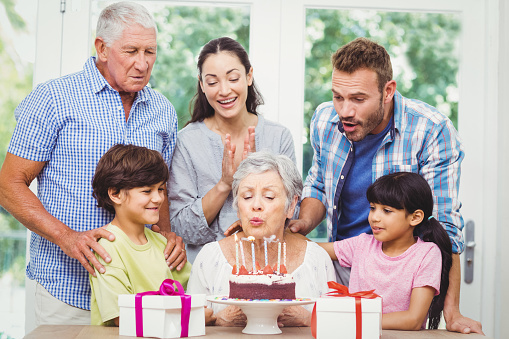 Like many families, we like to get together on every family member’s birthday. As part of the celebration we all sit at the dinner table and, one by one, tell the birthday person what we like about them. Our kids Scott and Debbie used to protest this tradition, but today they encourage their kids to take part in it, too. It’s an easy thing to do and a great way to make someone feel extra special on their special day. Here’s another Blanchard tradition: every Christmas Day, between dinner and dessert, all our family and friends who are gathered share something special with everyone. They can sing a song, recite a poem, or tell us something important in their lives. This not only delights all those who are gathered, it makes the day more memorable and meaningful. We know several couples who plan a date night at least once every two weeks. They make a rule that they can’t talk about work or the kids—only about their relationship. “How are we doing with each other?” If every couple did that 26 times a year, I guarantee there would be a lot fewer divorces. Structure also helps our family business. You may or may not know this, but The Ken Blanchard Companies is family owned. Margie and I cofounded the company almost forty years ago—and Scott, Debbie, and Margie’s younger brother, Tom, joined the company around twenty years later. Sometimes family businesses work well and sometimes they don’t. We didn’t want to run the risk that our family business would mess up our family, so Scott had the idea that the five of us should meet one day every quarter with an outside consultant/facilitator. And what a great idea it was! We’ve been holding our “Family Council” meetings for a number of years now. More recently, Tom’s wife, Jill, and Scott’s wife, Madeleine, have joined us. We all know it’s due in no small part to these meetings that we still love each other and often vacation together, even though we work together almost every day. So follow Drucker’s advice. If you want good things to happen, put some structure in place—it’s as easy as starting a few simple family traditions. When families find new ways to celebrate their positive relationships, life gets more enjoyable.